My son accidently ran over my chihuahua Chancho today, he is in ICU at the animal hospital with a possible broken back. 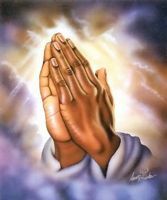 I have been praying all afternoon and night that God help him come back home to us good health. We just lost our other dog to cancer last week his name was Bean we loved and miss him so much, and now this happens to Chancho. These guys were not just pets, they were my boys I would cook for them mostly breakfast, my wife would feed them their food at night. Bean was my big boy and Chancho my little boy. We need all the prayers we can get for Chancho, I know that it will help.